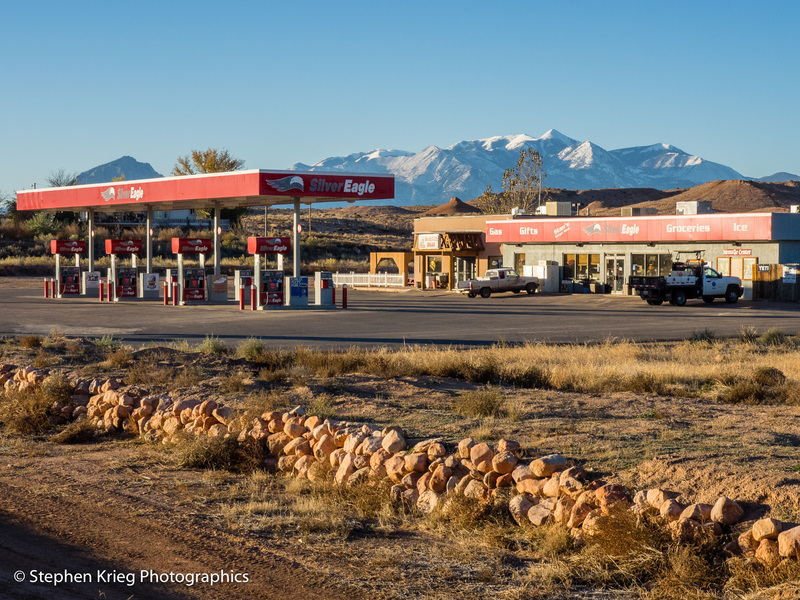 The Silver Eagle convenience store, Hanksville, Utah. Hanksville, Utah, on a frosty November morning. I stop in at the Silver Eagle convenience store — effectively the heart of town since it’s open all winter. Especially since it contains Stan’s Burger Shak, home of the Hanksburger. Also buffalo burgers, veggie burgers, and lots else. And it will be open all winter this time, unlike last year. I am close to home this morning — a mere 100 miles — and have all day to get there. Still, I am out of the chute this early, wanting to both enjoy whatever I might see, and get home early and unpack and relax. The Henry Mountains, from south of Hanksville, Utah. South on Highway 95. The snow shrouded Henry Mountains — the very last mountain range in the continental United States to be explored and mapped, you know — glisten to the west above the high sagebrush plain. In geologic terms, the Henrys are a laccolith. Whether you care about “rocks” or not, imagine the forces within the Earth’s crust bulging up magma (it’s only called lava once it flows onto the surface) but not erupting. The overlying rock layers are tilted by the pressure, of course, forced to assume steep angles. Then the force eases, subsides. And the surface layers that have been roused from their peaceful sleep are now exposed to the weathering forces of the Earth’s atmosphere. Erosion. And now we are here at this stage of their erosion. Tall mountain peaks seemingly jutting up out of nowhere. The mysterious abandoned Winnebago, out the middle of nowhere. But also jutting into the foreground was that abandoned Winnebago RV. As always it made me wonder how it had gotten there. I couldn’t see a road out onto that spot in the sagebrush. I’d asked a cashier in Hanksville if she knew its story. “I’ve only been here three years, I don’t know”. I would’ve found a local who knew the first week I was there. Maybe I should move there. Cottonwood trees in fall colors, North Wash. Setting aside thoughts of relocation to a dusty but friendly high desert town in southern Utah, I started down the North Wash section of Highway 95. An interpretive sign told of how the highway was pioneered. It seems that a local citizen grew impatient with there being no road from Hanksville down to Glen Canyon and the Colorado River, so he exercised some initiative. He “borrowed” one of the county’s bulldozers and pushed the dirt and boulders aside with it until there was one. Apparently law enforcement was a bit more lenient about such things then than it is today. North Wash cottonwood trees fall colors glory. But the route to the river eventually became a modern paved highway. Not heavily used, mind you. If you drive it you can often count the number of other vehicles on one hand. I like that. Anyway, it was still a bit frosty down North Wash. But there were still cottonwood trees on the floodplain in full fall color glory. So of course I had to stop and photograph. 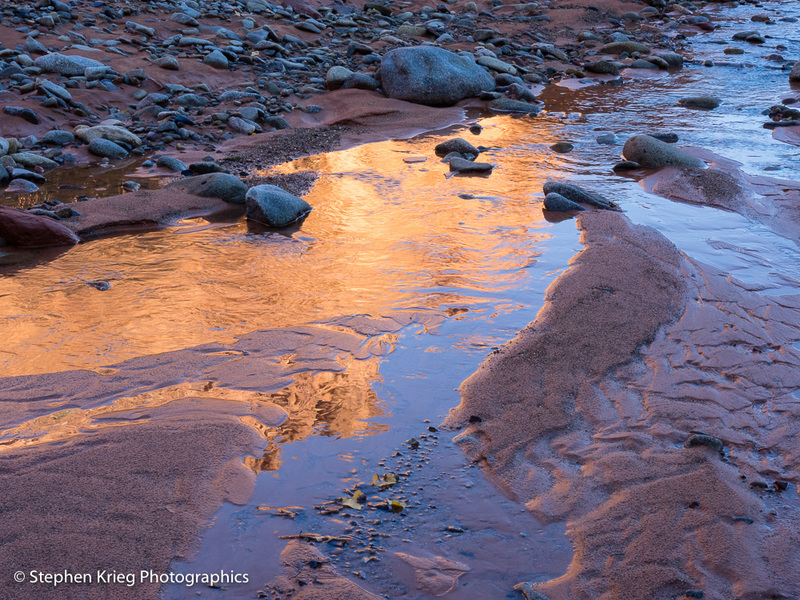 Red cliffs reflection in North Wash. The air was so still, not a leaf moved. Silence. Morning light, growing brighter as the sun approached the canyon’s rim, out of sight for now. But not for long. I should have waited until it came over the top to really light up the cottonwood colors. But I felt impatient, I don’t know why. 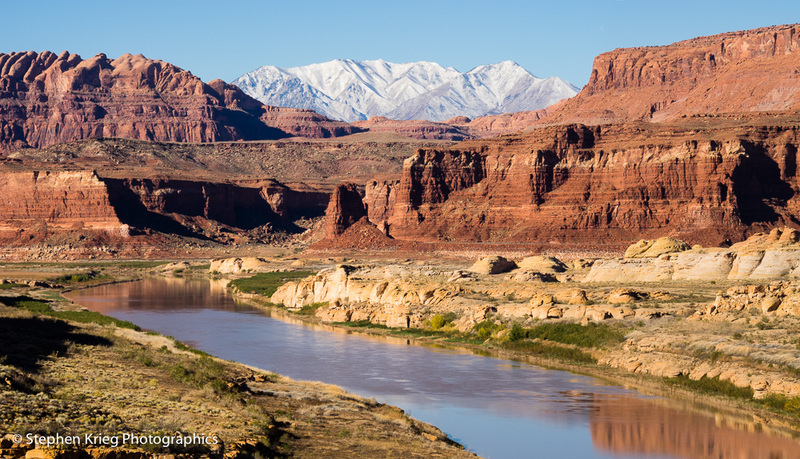 The Colorado River, Hite Crossing Bridge, Utah. Down to the Colorado River. I pulled over at the bridge to take some photos. I liked what I saw. Maybe this was why I’d felt too impatient to linger longer up the North Wash. I liked them both a lot, but you can’t be everywhere at once. And in this area of the country I’ve found that you can’t make a bad choice most of the time. Just pick one, you can’t lose. I drove the mile back into the Hite Ranger Station. I always like going there, despite it being almost a ghost town. Because Lake Powell is down to less than half its capacity. The marina that once throbbed with powerboat tourists is gone. The Colorado river there is back to being a free flowing river. The still water of the reservoir now lie just south. 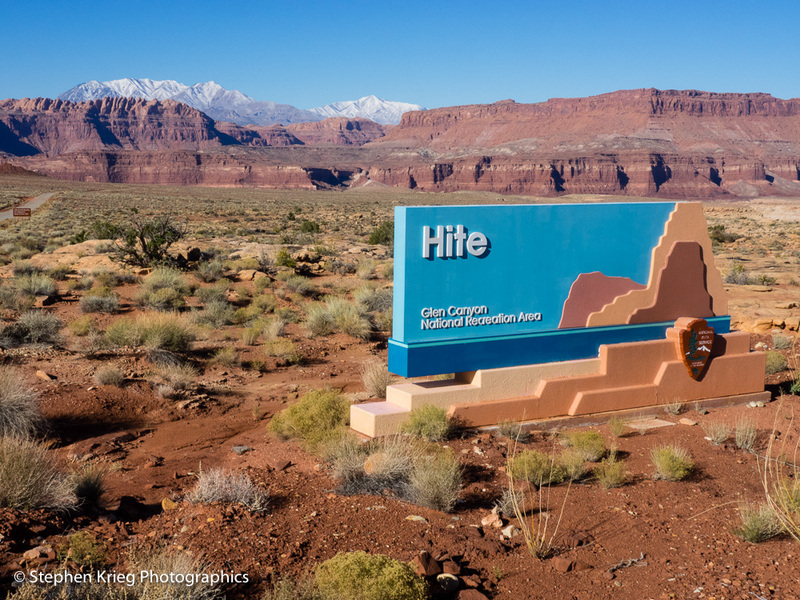 Hite, Utah, Glen Canyon National Recreation Area. So I notice the park housing for the employees, now vacant except for one, a recently filled Law Enforcement National Park Ranger. I’ve met him, he seems great, and I hope he can stay for a while. He seems to appreciate the austere land, the canyons and rivers. I stopped at the gas pump and convenience store. I peered in the windows of the store to see what was in there, in season. “It’s closed”, a grizzled man told me as he came around the outside corner of the building. He wasn’t a Park Service employee, but an employee of the concessionaire, Aramark. He had been sent up from Bullfrog, on the west side of Lake Powell, to work on the generators in the off season. Or whenever things needed working on. I explained that I worked at the Visitor Center at Natural Bridges, and that visitors were often inquiring what services were available at Hite, so far from where they were going to where they were going. He understood. He let me into the store to look around. I noticed the racks of t-shirts and sweatshirts shrouded with bedsheets for the winter. I noticed some of the books for sale, books being a keen interest of mine. Then I thanked him and bid my farewell. 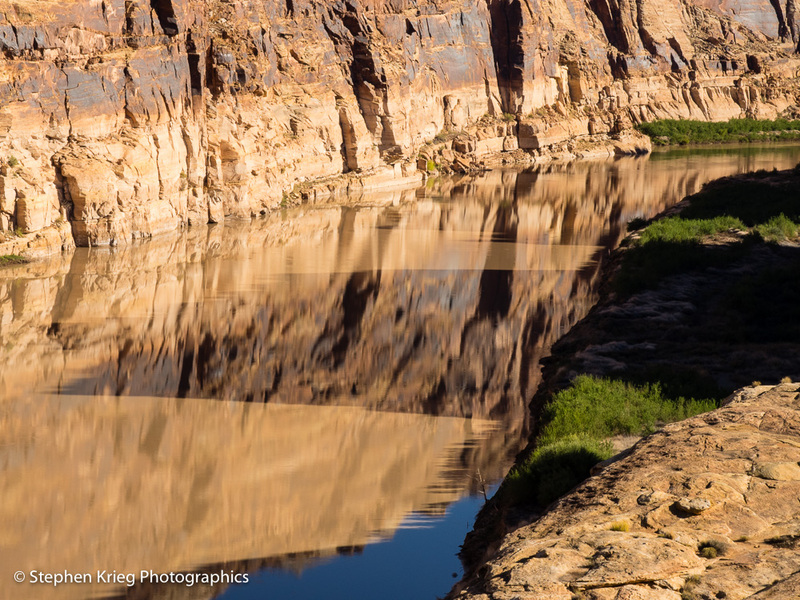 Morning reflections of the cliffs onto the Colorado River at Hite Crossing, Utah. It’s a fascinating place. Named for the smart, tough, legendary pioneer Cass Hite. I’d read his biography. I will read it again. 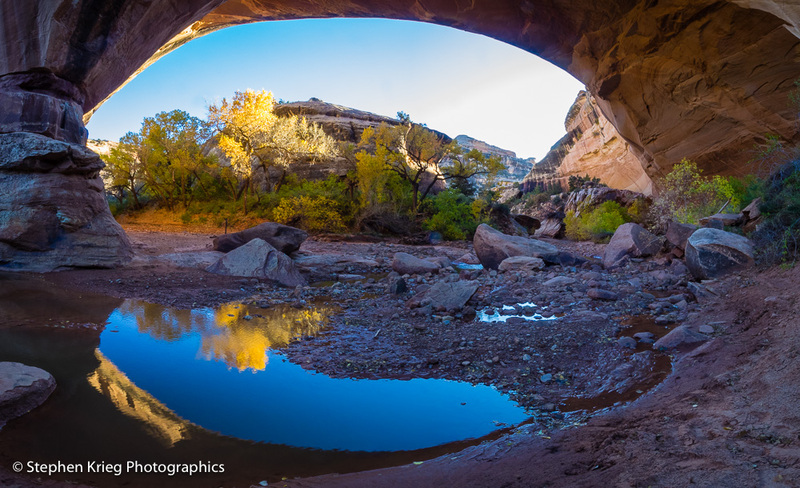 Photo locations: Hanksville, North Wash, Glen Canyon National Recreation Area, southern Utah. Sipapu Bridge trail down into White Canyon, Natural Bridges National Monument. Click on the image for a much larger version. Winter has come early this year. 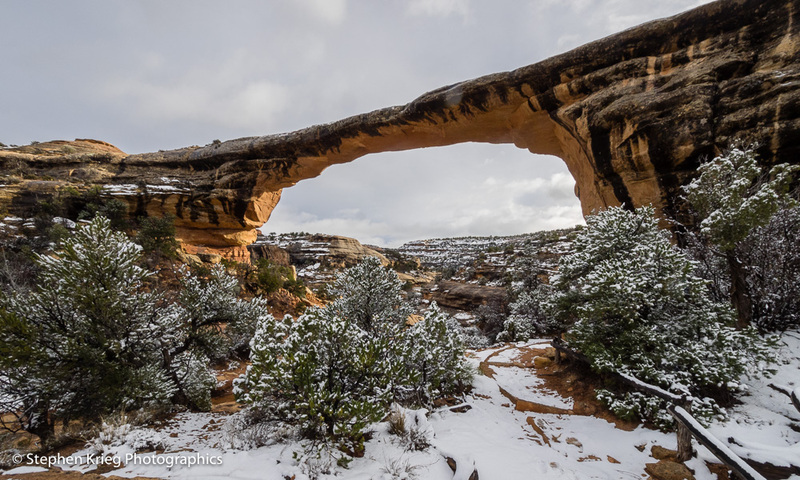 The third snowfall has already occurred at Natural Bridges National Monument and Cedar Mesa in southeast Utah. And I am glad for it. 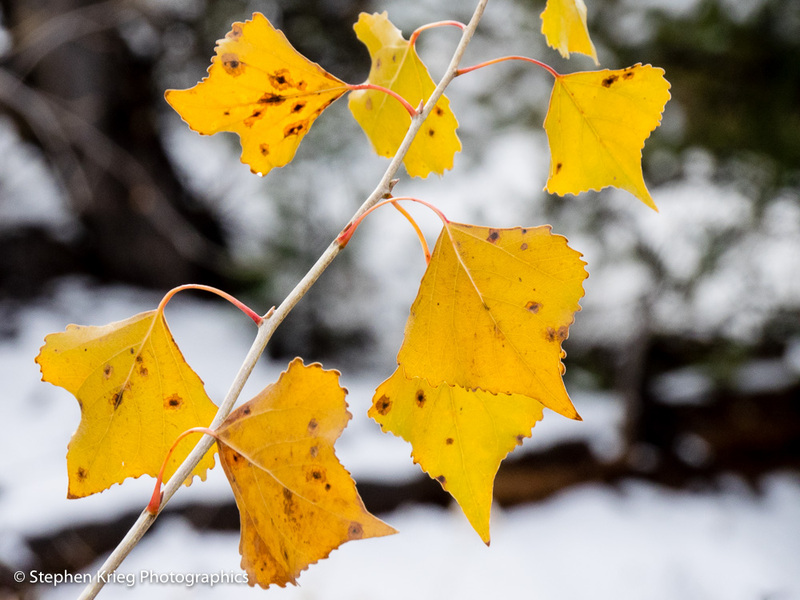 Because after the leaves are off the trees and shrubs, after there is no green of deciduous foliage in the stream bottoms and among the pinyon pines and junipers, the grasses and forbs and wildflowers all being long done, the canyons look so drab by comparison. Snow coated Douglas-fir, Pinyon pine, and Utah juniper trees. And desert varnish on the cliffs. Snow sure fixes that. 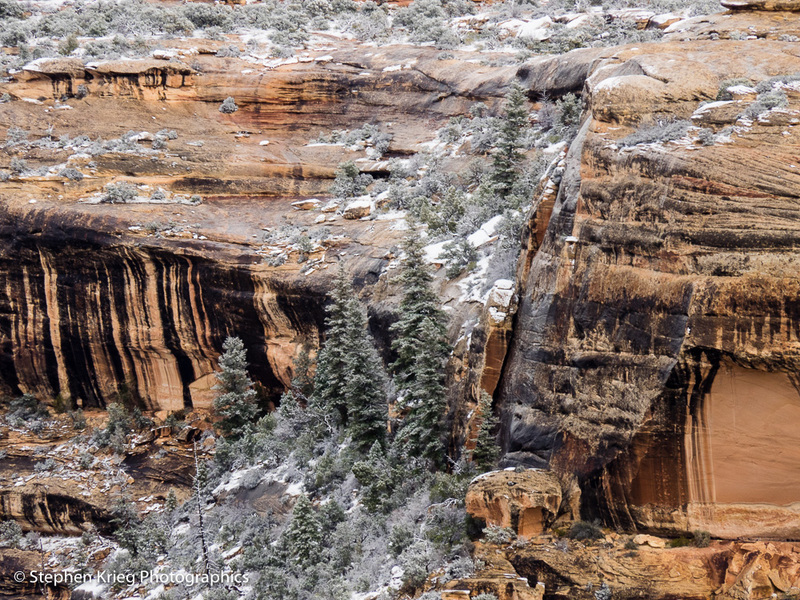 Because Cedar Mesa is a desert, visitors are often surprised to hear that it snows here. But then again many people think that desert means low desert, like the Sonoran Desert zone in southern Arizona. The ledge below Vulture Point, Sipapu Bridge Trail. But this is the high desert. In fact, Natural Bridges is the uppermost of the high desert. It lies just below Elk Ridge, which is mountain country: Ponderosa pine and aspen forest type. You can drive up there in just a few miles and you’ve risen two thousand feet in elevation. Meanwhile, down here at Natural Bridges, I hiked down the Sipapu Bridge trail to see how conditions were for the park’s visitors. The overcast sky, after the snow storm, made for reduced contrast, while still providing a nice soft and bright light. A welcome change from the deep shadows and blue sky. People ask me all the time: which Bridge is best in the morning, the afternoon, etc. I usually reply: I don’t care when I go down into the canyons. The trails lead you right down underneath each bridge, so you can get great shots from either side, depending on how the light is at that time of day. So the important thing is: just get down there! Even better, do one of the loop hikes, and you will see even more. And that’s just the canyon landscape. There are only three ancient ruins in the park that the staff is allowed to talk about. The others are located throughout the park and are some of the best preserved of their kind. 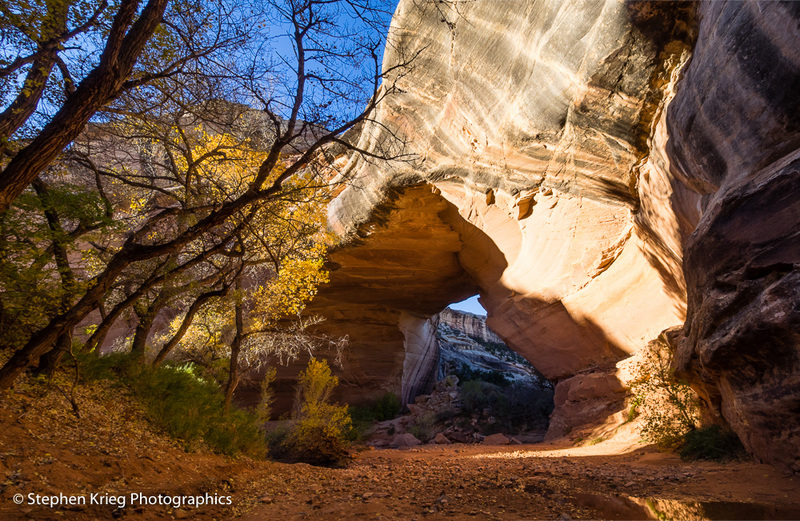 After all, President Teddy Roosevelt declared this park Utah’s first National Monument in 1908. Ancestral pueblan (Anasazi) cliff dwelling ruins, Natural Bridges National Monument. No, I won’t tell you how to get to this site. After enjoying another hike down the Sipapu Bridge trail, I returned to the canyon rim and drove on. Fall colors are one of my things, and any remaining colors, no matter how scant, catch my eye. 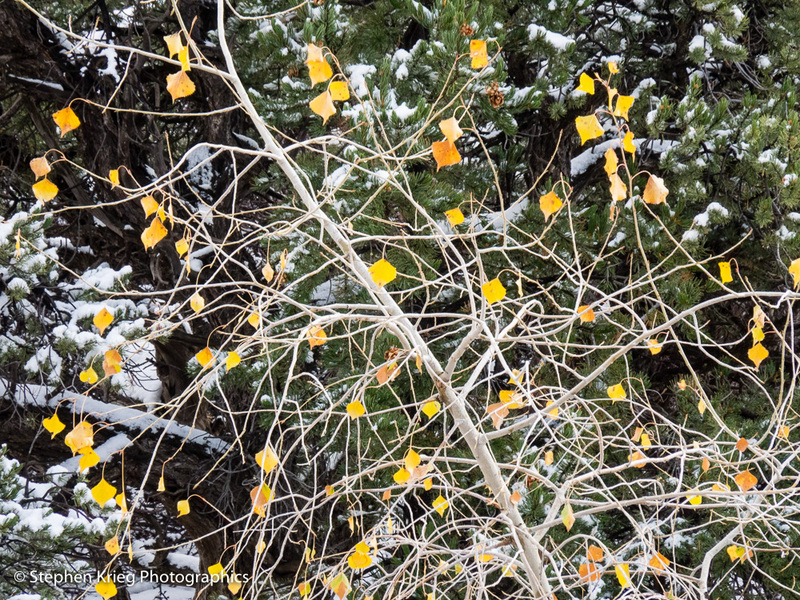 Like these Fremont Cottonwood leaves, still holding out in the snow. Not for long, though. 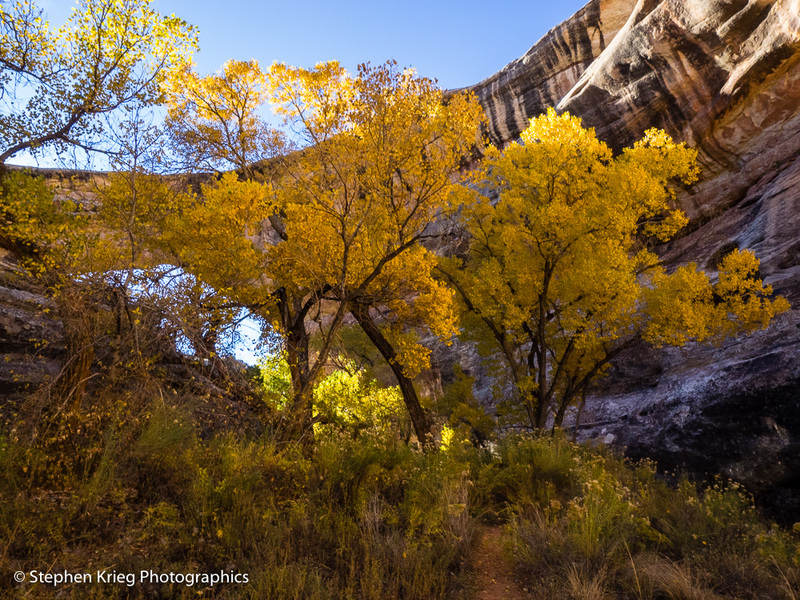 Fremont Cottonwood last gasp fall colors, Natural Bridges National Monument. The Utah junipers in the background, especially with shadows and touches of snow, make for a nice canvas. Then it was on to Owachomo Bridge. The old lady of the trio. The one that will collapse the soonest, “soon” being very relative in geologic terms. Tomorrow? A thousand years? Owachomo Bridge was the one that actually had some snow on her by the time I got there that afternoon. She’s the most wide open, rather than tucked down at the bottom of White Canyon like Sipapu Bridge and Kachina Bridge are. So I got to angle around quite a bit for some good snow shots. Especially when the late afternoon sun made a brief appearance and lit up her southside buttresses. Lovely, very lovely. But back to imagining when the last leaf of autumn might fall. When? Where? 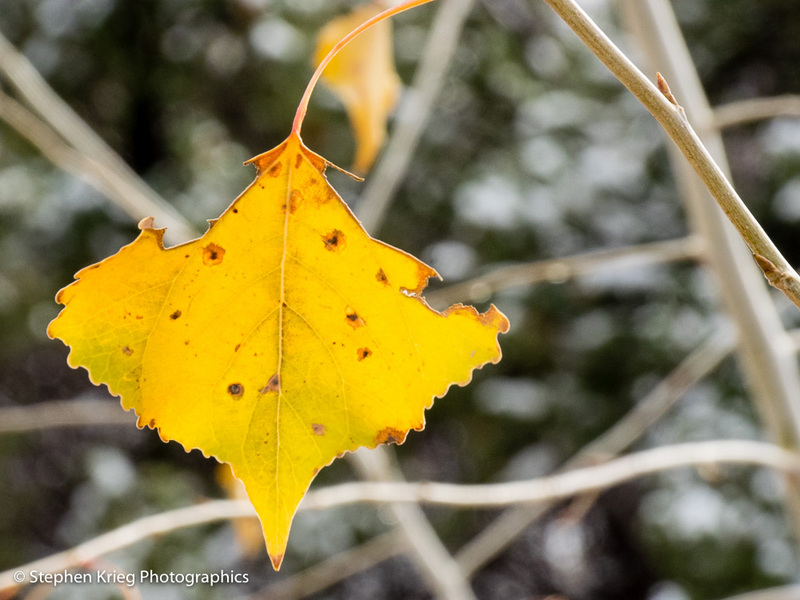 Fremont Cottonwood leaf and third snow of the season. It’s rather a trick question, because in a way it never does fall. Not in autumn, anyway. Some trees shed all their leaves in the fall, while others — notably the oaks — hang onto at least some of them throughout the winter. There’s lots of variation: climate, microclimate, genetics. Nothing happens all at once. Thus the last leaf might actually not fall until spring. When the new growth pushes any remaining holdovers off the twig. Watch your own favorite trees and try to notice what they do. It’s fun to contemplate. 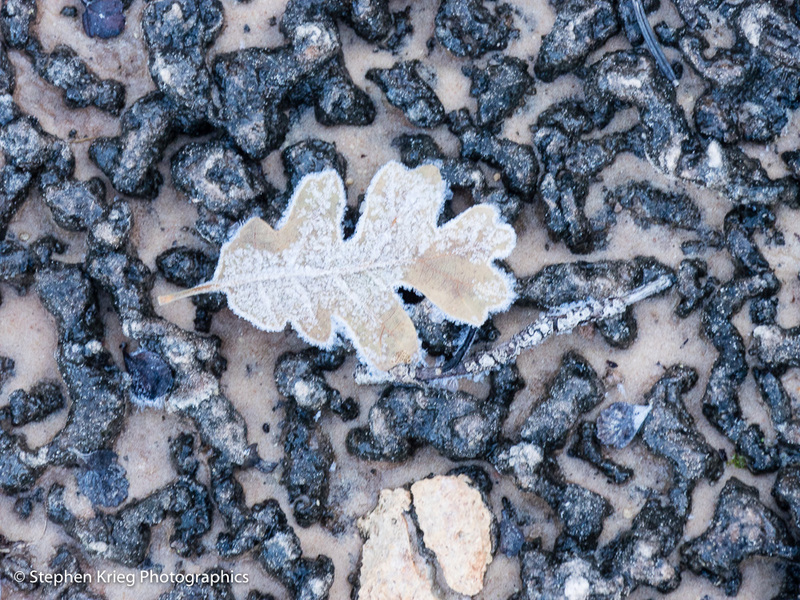 Frost on Gambel Oak leaf and cryptobiotic soil crust, Natural Bridges National Monument, Utah. 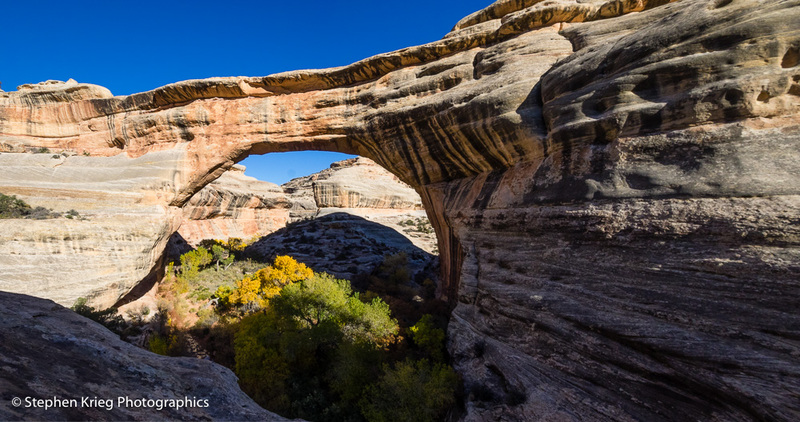 Photo location: Natural Bridges National Monument, Utah. 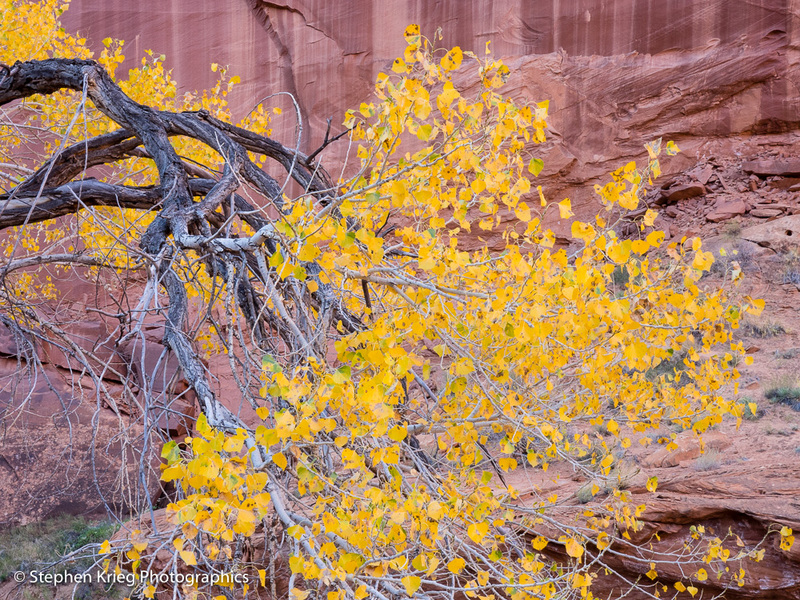 I returned to Capitol Reef on a splendid November day. A recent early snow storm had left the distant Henry Mountains with a fresh coat of snow. An excellent backdrop to the fantastic bare rock forms down below. 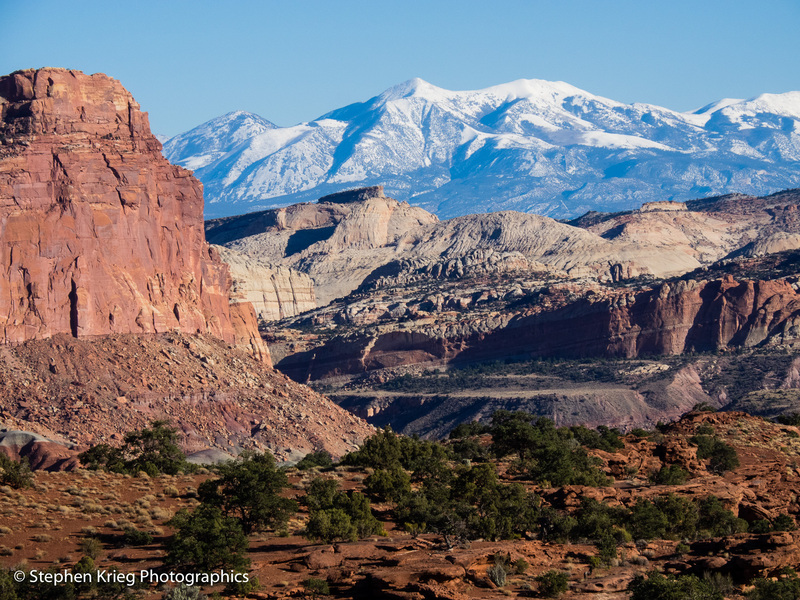 Capitol Reef National Park and the Henry Mountains, from the west entrance. 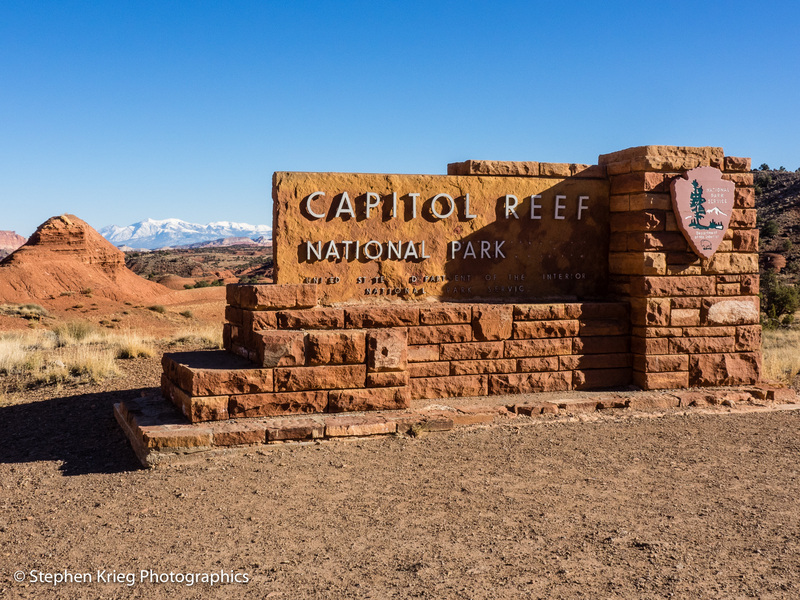 The name Capitol Reef came about because the first European and American explorers and pioneers found the upthrust cliffs to be a serious barrier to their travel, like an ocean reef dangerously in the way. But they were also grand and stately, towering overhead and reminded them of the Capitol building in Washington, D.C. Okay. Capitol Reef National Park west entrance. I was entering the park from the west, on Highway 24. I was looking forward to finally getting into the Visitor Center, because on my previous visits I had arrived too late for their winter hours. But I’d forgotten that this day was a national holiday — Veterans Day — so it was closed anyway. Next time. Capitol Reef’s fall colors, from the Visitor Center parking area. 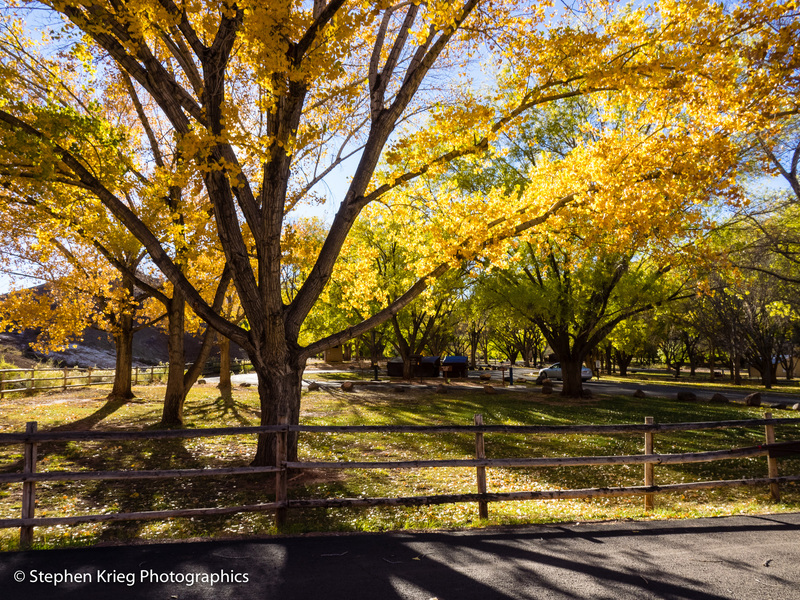 The park campground was glowing in the last fall colors of the cottonwood trees in the late afternoon sunlight. Only a few sites were taken. I would have loved to camp there, but it was not my destination for the night. The lovely campground at Capitol Reef. So I spent the rest of the late fall daylight doing the parks’s Scenic Drive, which is 10 miles to the end of the pavement. It’s not a loop drive, so you come back out the way you went in. The cliffs near Capitol Gorge, late afternoon. Unlike my other visits to the park, the two unpaved roads were still open: Grand Wash and Capitol Gorge. I had enough daylight left, so I drove both, enjoying more of the fantastic cliffs. 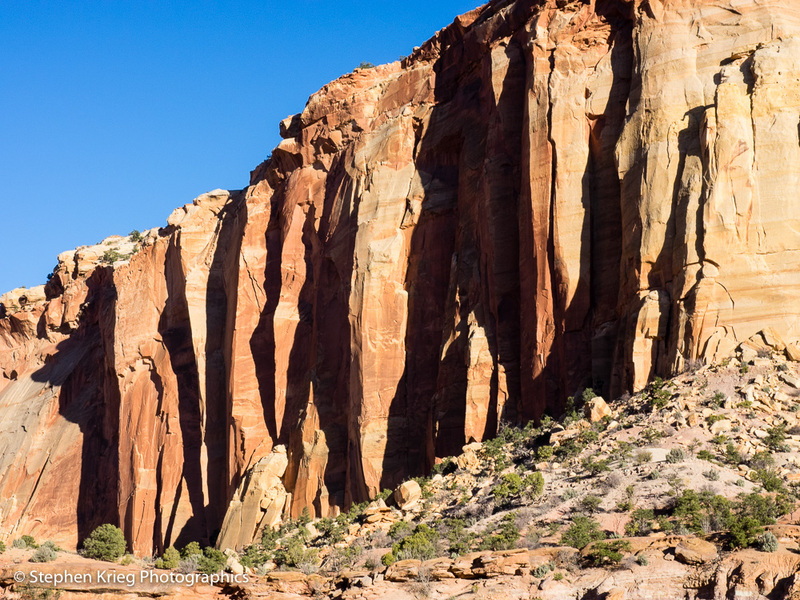 Capitol Reef cliffs panorama – click on image for much larger version. But then it was time to travel on to my evening’s destination. So it was back to Highway 24, and east to Hanksville. But before leaving the park’s confines I once again enjoyed the sunset lighting up the highest layers of almost white sandstone. The highest layers at sunset time, from Highway 24. There is much more to this incredible park than this quick visit sampled. I have been to some parts of it, and others I have yet to explore. I am looking forward to both revisiting the familiar, and investigating what’s new for me there. Photo location: Capitol Reef National Park, Utah. Kachina Natural Bridge approach, November. The late fall sunlight was beginning to fail me down in the canyon bottom. I wished I had been there an hour earlier, or two. But I wasn’t. I would have to see what I could make do with what I had left. So I hiked down the mere 0.7 mile from the parking lot and trailhead down to Katsina (Kachina) Bridge. A beautiful winding trail that drops 400 feet in elevation in that short distance. Crossing the shallow riffle flowing out of the mouth of Armstrong Canyon, I hiked up onto the sand bench above the stream, then down onto the floor of White Canyon. The approach to Kachina Bridge, awesome as always. The Fremont Cottonwood trees to the left were already in shadow. Darn. I’d wanted them lit up by the low sun. But now it was too low for that. Still, the combination of sunlight and shadow on the western face of the bridge was interesting. I was rather pleased with the composition. I walked underneath Kachina herself, to the far side of the stream and up the opposite sandy bank. Turning around, the pool of water beneath the bridge reflected those cottonwood trees still lit up by the sun, dazzling with their fall colors. 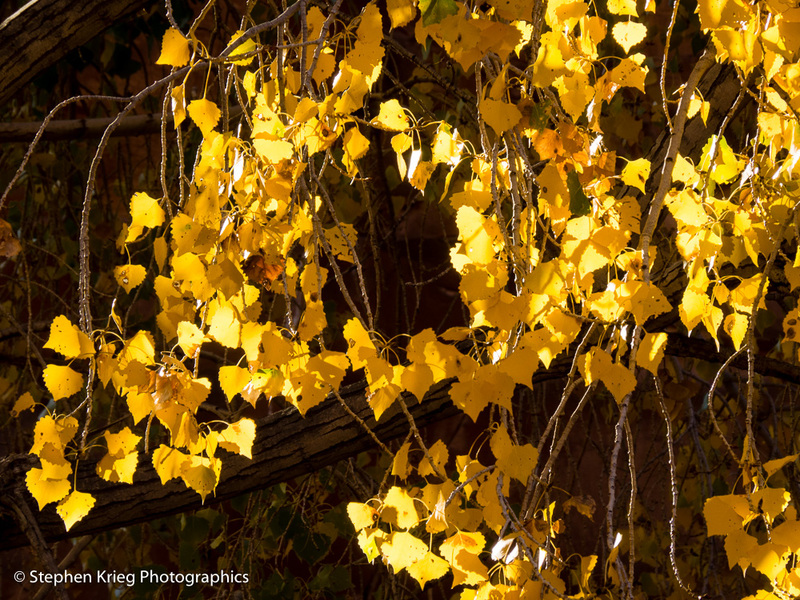 Underneath Kachina Bridge, fall colors reflection. Satisfied that I’d done what I could given the conditions, I returned up the trail. The lung-exercising, sweaty climb back up. Partway up I met a group of NOLS (National Outdoor Leadership School) backpackers. They were going up White Canyon and then Deer Canyon. They use Natural Bridges as part of their trip. I quizzed the leader a little bit about where they had come from and where they were going to camp. Then I let them move on, because they were running low on daylight. 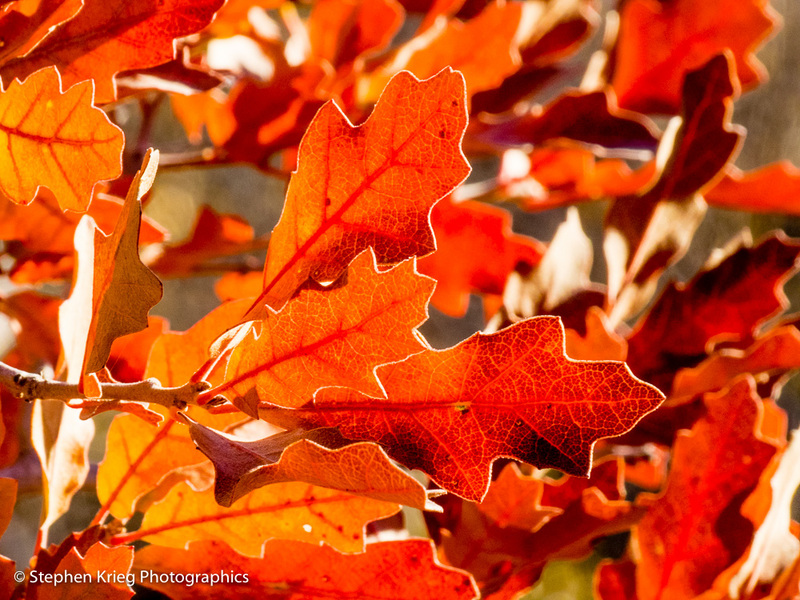 Gambel Oak fall colors, Kachina Bridge trail. Further up the trail, in sunlight again, I stopped to admire some of the small tree species in their fall colors glory. Their leaves would very soon be on the ground, quickly losing their color. 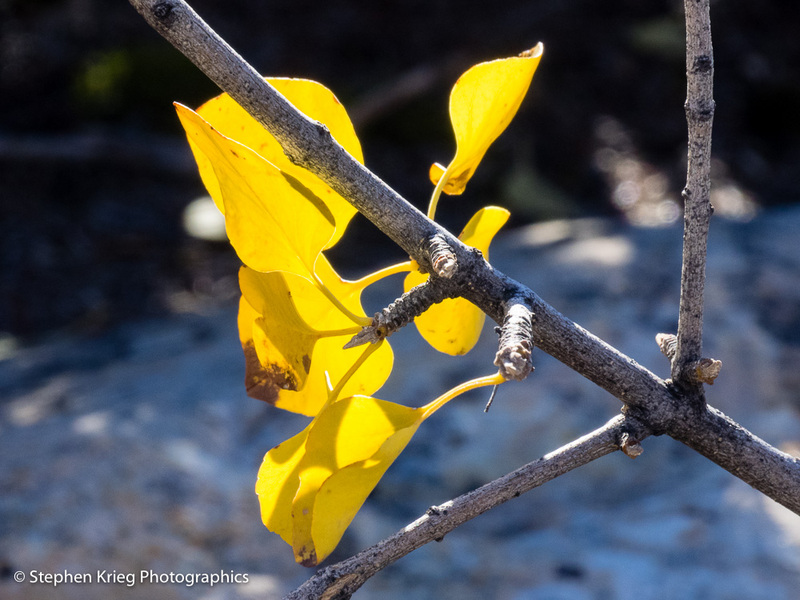 Single Leaf Ash, fall colors, Kachina Bridge trail. 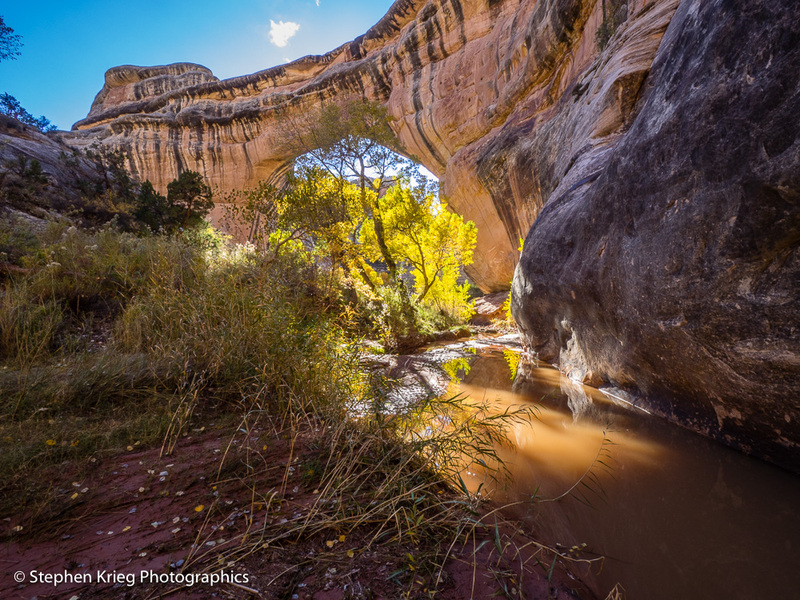 Photo location: Natural Bridges National Monument, San Juan County, Utah. Sipapu Bridge, from the trail down into White Canyon. Early November: time for the high desert fall colors, now that the high country show up in the aspen forest zone is over. So at Natural Bridges National Monument in southeast Utah’s San Juan County, I headed down the trail from the parking lot on the Loop Drive (formally “Bridge View Drive”) to Sipapu Bridge. I didn’t have a whole lot of time that afternoon, sunlight wise, due to the short days. So I hoofed it hard down the trail to catch up with the light still making the Fremont Cottonwood trees glow in the canyon bottom. Sipapu Bridge is the sixth largest natural bridge in the world, and second largest on this side of the world, after Rainbow Bridge in Glen Canyon. (The four largest natural bridges are all in China.) Earlier this season I’d met a young man at this point on the trail, the best vantage point for getting the blue sky in the photo through the bridge’s span (opening), and he said: “It’s even bigger than I thought it would be”. A few golden cottonwood trees are visible from up above, but to get the full treatment you have to go down. All the way down to the stream bottom in White Canyon, 500 feet below the trailhead up on the rim. Underneath mighty Sipapu Bridge, sixth largest in the world. Since the sun was low in the west, I took a hard right turn, east up the canyon bottom, to use the sunlight to backlight the cottonwood colors, which makes them glow their brightest. Underneath Sipapu, looking up makes the immense span arching high overhead look thin compared to the side view from above. 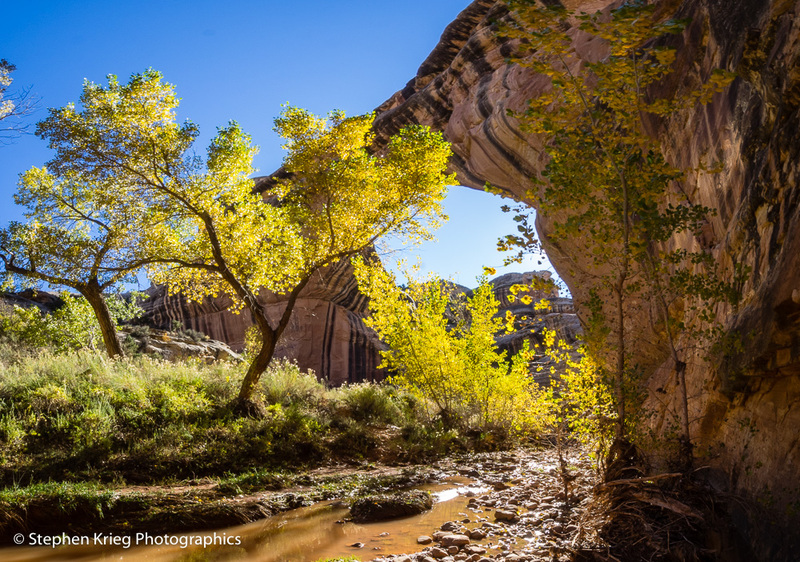 Fremont Cottonwood trees in fall splendor, White Canyon above Sipapu Bridge. I walked a bit further upstream along the bank in order to position some lit up cottonwoods in front of the mighty bridge. I made a few exposures from up on the bank of the stream course, which only flows intermittently with the rains and snows. The low angle of the sunlight through the bridge’s opening not only lit up the trees, but reflected off the muddy water of the stream. The low shaft of sunlight in the deep shadows made the scene feel like a secret garden portal or something. Pools of water from recent rain and snow storm, White Canyon. Then I jumped down into the stream bed itself. 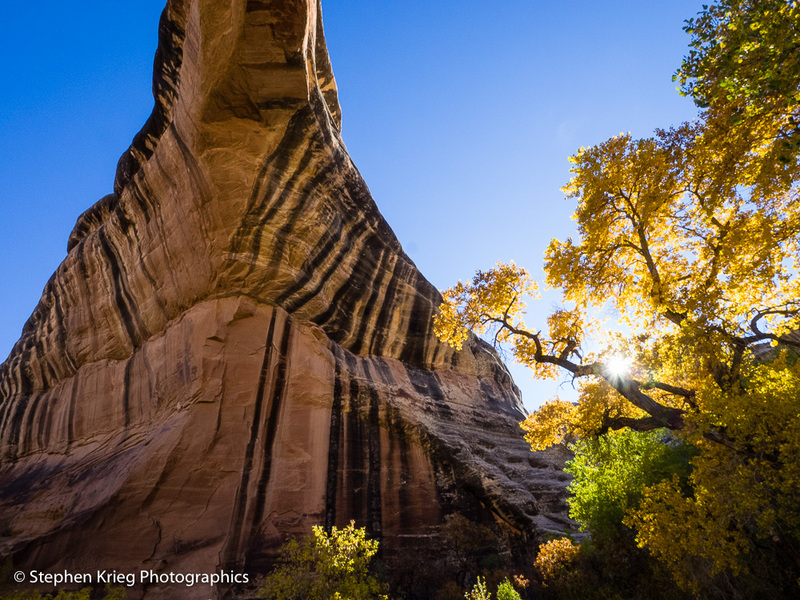 Being at the very buttress of the immense arch of Cedar Mesa Sandstone makes for cramped quarters in the camera viewfinder, even with an ultra wide angle lens. In order to create the composition I wanted, I made two or three overlapping photos, and later merged them into a single high resolution panorama in Adobe Lightroom. Ultra wide angle two shot panorama at Sipapu Bridge. Satisfied with this portion of my foray, it was time to pound it back up the trail to the parking lot. Because I was going to try to bag fall colors shots at the second of the three bridges, too: Kachina Bridge. I was quickly running low on sunlight in the canyon bottom.